Jason is one of the most important people at a RockBar White Elephant Burlesque show -- he manages the bar, and is partially/majorly responsible WEBurlesque maintaining a home there. You can find him on Tuesdays at RockBar, co-hosting Trivia Tuesdays, and behind the bar several times a week. 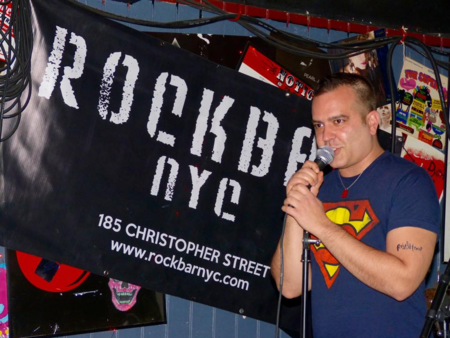 He is also the man behind Miss RockBar NYC, for which Ophelia Nightbird won the first cycle, and the man behind the scenes nearly all the events at the bar. In 2016, he and Witti Repartee starred in his directorial debut at RockBar, a staged reading of Charles Busch's Die Mommie Die. WE's managed to get Jason into his skivvies on stage (off-stage, it happens too, what with RockBar's penchant for underwear parties) three times now, twice on his birthday. His acts were a tribute to American Psycho and Psycho Beach Party and a duet with his husband, Jarrod, for a Jason Vorhees/Freddy Krueger duet. His last ventures to the stage were to sing as Brad Majors in our Rocky Horror tribute show. His "Once in a While" was certainly not left on the cutting room floor. He also presented Viktor a surprise, special Jason's Choice honorarium at the Silver Tusk Awards. WE was impressed; it's clear he's been watching us with a steady eye, cuz he's one of our biggest fans, too.